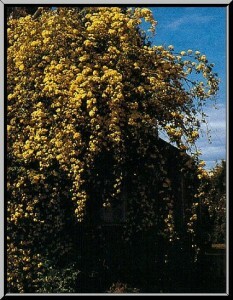 The Yellow Lady Banks is an extremely vigorous, once-blooming yellow climber that will happily cover any nearby tree or structure. Its distinctive clusters of yellow flowers in the spring make it easy to identify. It is thorn-less and has little to no fragrance. It grows to 15-20′ high and 8-12′ wide. Lady Banks Yellow’ is one of the great classic roses. It is the double yellow form of Lady Banks White. It is slightly more hardy than the White Lady Banks rose. This rose is generally much too large for a small garden, but it will provide spectacular spring displays when allowed to cover an outlying tree, wall or building. The Yellow Lady Banks rose is very long-lived, it is a vigorous climber that will happily climb to the top of any nearby tree, fence or arbor. Although the plant is thorn-less, the long graceful arching canes reach and grow into any adjacent means of support. The abundant evergreen foliage is small and dark green in color with narrow leaves. It blooms once in late spring and lasts for about 4 weeks. In order to thrive, this rose needs a sheltered sunny location, but it will grow fine under a wide variety of conditions. It is tolerant of poor soils and is unpalatable to deer. The ground around the base should be kept free of competing vegetation by mulching. The blooms occur on the second and third year wood, so dead wood and older growth should be pruned out as required.